TIMES, TIME, AND HALF A TIME. A HISTORY OF THE NEW MILLENNIUM. Comments on a cultural reality between past and future. This blog describes Metatime in the Posthuman experience, drawn from Sir Isaac Newton's secret work on the future end of times, a tract in which he described Histories of Things to Come. His hidden papers on the occult were auctioned to two private buyers in 1936 at Sotheby's, but were not available for public research until the 1990s. 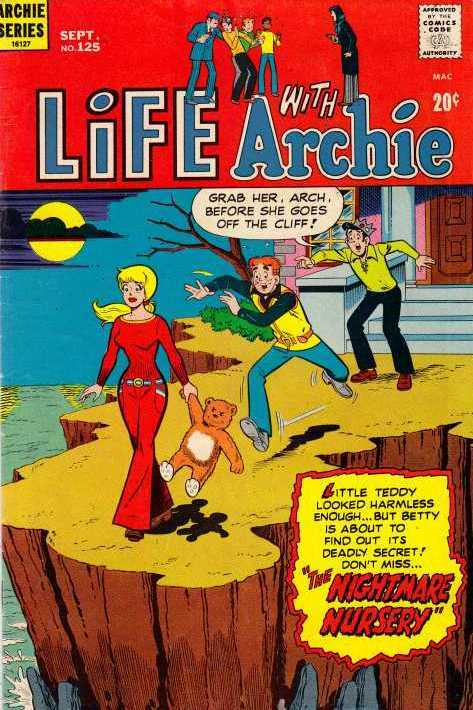 Life with Archie #125 (September 1972). Image Source: Kermit's Pad. The gang inspects an old house where a Satanically-possessed teddy bear, brought into the house by a woman who once used it to kill a little girl, exercises its spell on Betty and induces her to attempt suicide. Really. 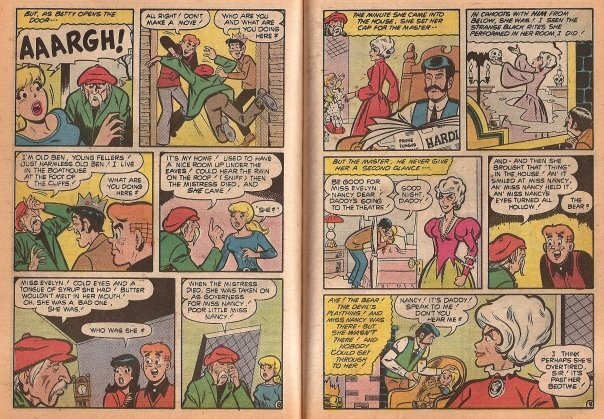 Archie was known for occasional innuendo which sailed over the heads of its young readers (at least, I hope it did), only to be revisited decades later. But "Nightmare Nursery" went way beyond innuendo. 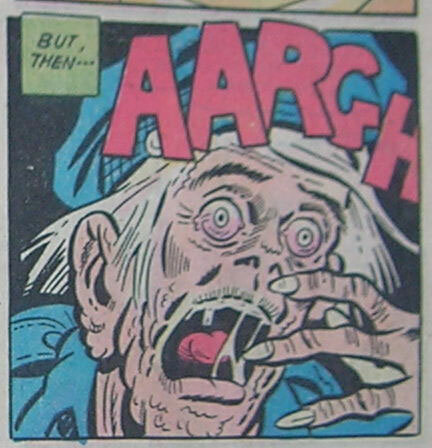 With themes borrowed from the horror comics and films of the 1970s, it clearly left an impact on readers. A few years ago when a chance reminder made me dimly recall it, I searched for it on the Web, in vain. I found only a forum where someone else was also trying to find this issue and complaining along the lines of, 'Does anyone know what I'm talking about? 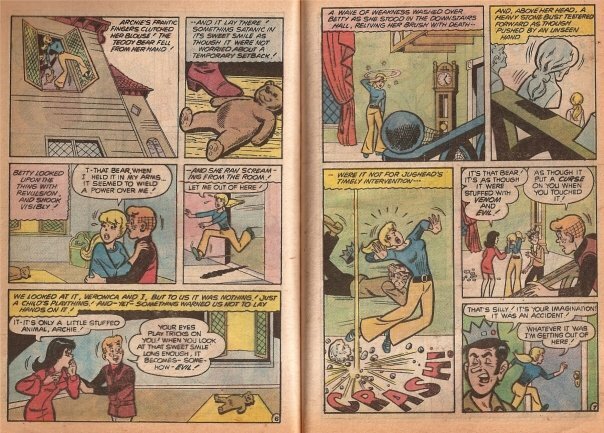 The Archie Comics demon teddy bear story? If I don't track it down, it will haunt me to my dying day.' A few years have passed, the Web's fund of digital ephemera has piled deeper, and now I have found it at last. 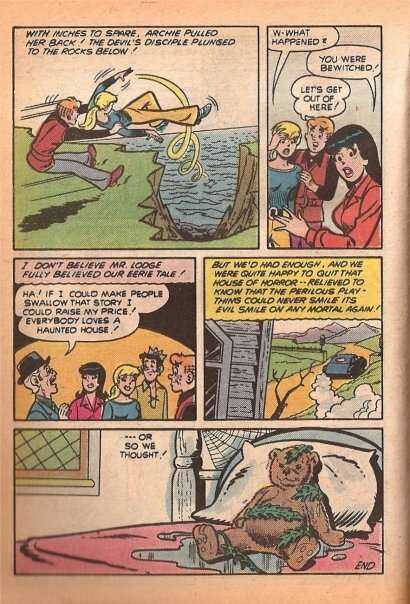 It turns out that "Nightmare Nursery" is notorious among Archie fans. 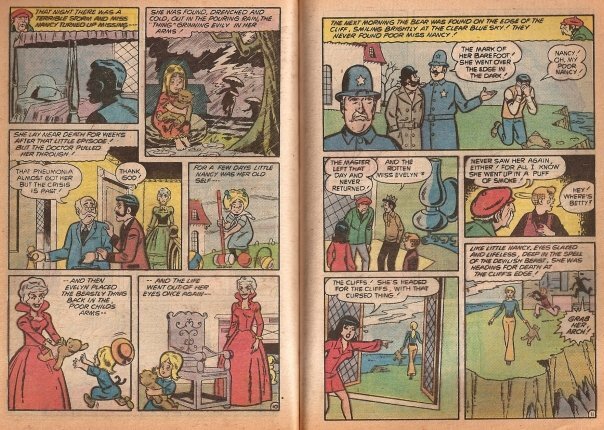 "Holocaust," Life with Archie #160 (Aug. 1975). Images Source: Chris's Invincible Super-Blog. 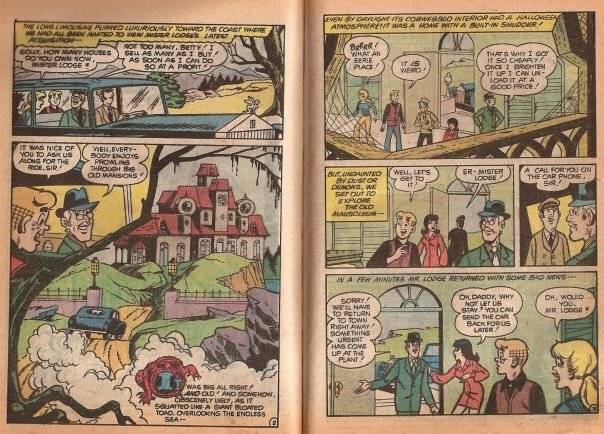 "The Thing in the Ghastly Green Box," Life with Archie #160 (Aug. 1975). Image Source: Chris's Invincible Super-Blog. A mysterious green box emits an invisible, steadily growing aura that causes instant aging and decay to anything -- and anyone -- within range. 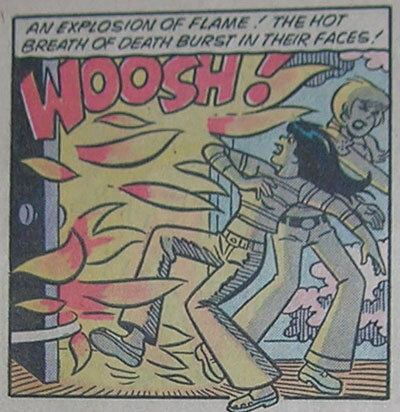 Archie comes up with a way to destroy the box before its evil force destroys the entire town. 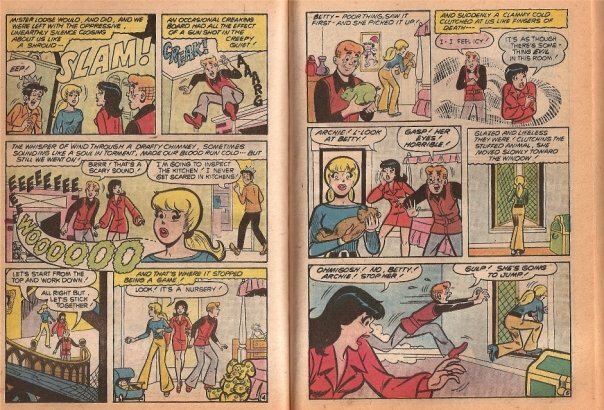 You can see bloggers talking about Life with Archie stories here and here. A sequel to "Nightmare Nursery" appeared with the Josie and the Pussycats characters, discussed here. 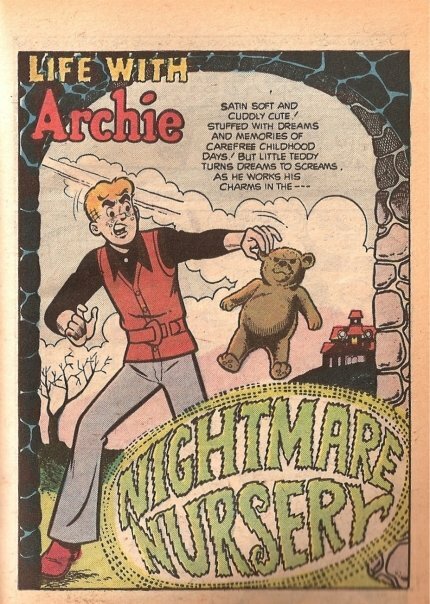 "Nightmare Nursery," Life with Archie #125 (September 1972). 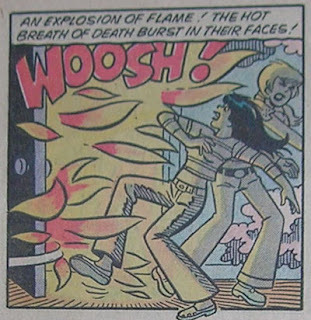 Credits: Frank Doyle/Bob Bolling and reprinted in Archie Annual Digest (Archie, 1975 series) #33 (1978). Click on the images to enlarge. Images Source: Facebook. See all my posts on Horror themes. See all my posts on Ghosts. Life with Archie is © Archie Comics and excerpts are reproduced here solely for the purpose of non-commercial review and discussion. NOTES FOR READERS OF MY POSTS. If you're not reading this post on Histories of Things to Come, the content has been scraped and republished without the original author's permission. Please let me know by following this link and leaving me a comment. Thank you. Tips always welcome! Please support the blogger. Spinner Memorial Part 7: "¿Gracias, Por Nada?" My New Blog: "The Craft of Living"
New Pravic Website and Blog! Apollo 18's Lunar Truth: Alternate History or Time Shift? All contents of this site not otherwise copyrighted are Copyright © 2010-2019 HISTORIES OF THINGS TO COME. ALL RIGHTS RESERVED.